Professional chiropody and podiatry in Leeds, with over 26 years of experience, 23 years in a private practice in Leeds city centre and 3 years in the health service. 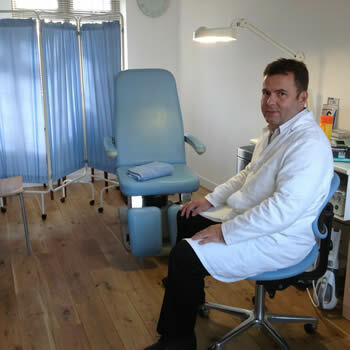 Simon has over 26 years of experience in chiropody and podiatry. For the last 23 years, he was in a private practice in Leeds City Centre and has now relocated to his home address on Street Lane. Prior to Simon's City Centre practice, he worked within the health service for several years. Simon offers a full range of professional chiropody treatment from routine foot care and foot health checks to nail surgery and verucca treatment. Simon prides himself in providing a very professional, calm treatment experience, and always puts himself in his clients position and treats people the way he would like to be treated himself. Many clients have been trusting Simon for many years, because of this philosophy he has towards treatment and the way he treats his clients. Call Simon today on 0113 237 1065 to book your appointment.